The ex-husband of a woman whose body was found in Silver Lake in Highland died of a gunshot wound to the head in the couple’s burning house in Glen Carbon, the Madison County coroner said Friday. The body found inside the house was identified as that of Justin Campbell, 37. The body of Campbell’s ex-wife, Cristy Campbell, 32, was recovered from the lake Thursday afternoon. The preliminary cause of death was exposure and drowning. A 3-month-old was rescued from a submerged SUV that police say was Cristy Campbell’s. The baby had been expected to be released from the hospital Friday. Police found a gun in the SUV in the lake. Coroner Stephen Nonn said in a press release that it won’t be possible to determine whether the gun recovered from the SUV was used in the killing of Justin Campbell because the bullet that struck Justin Campbell went through his body and was not recovered in the house. 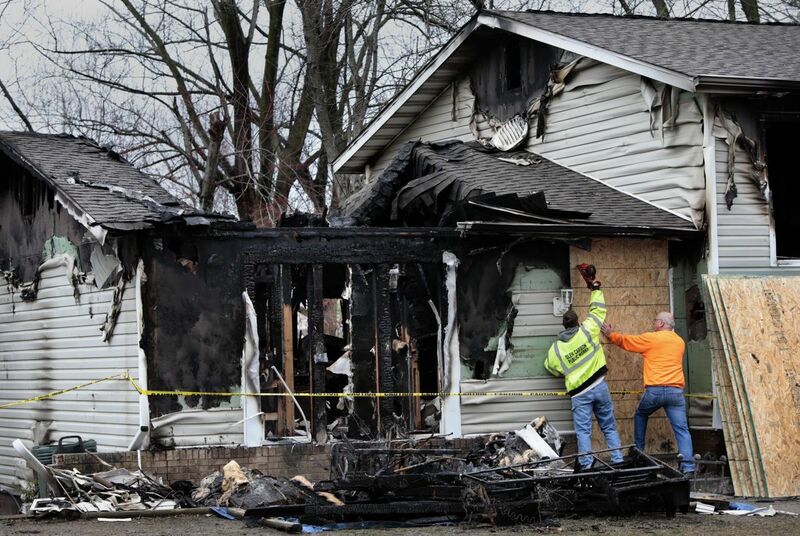 Authorities do not yet know if Justin Campbell was still alive when the fire began. Carbon monoxide testing will be done to determine whether he inhaled smoke. Authorities were not available Friday to discuss what they believed happened in the house or what caused the fire. But the positive identification of the bodies answered some of the questions that arose since the fire began and the SUV was found. The events began about 4:50 a.m. Thursday when an SUV pulled out of the driveway of the home on Dogwood Lane where Cristy Campbell lived with her seven children — four boys and two girls from 4 to 14, plus the baby boy, Julian, born in December. A neighbor told the Post-Dispatch that she believed Justin Campbell also was living at the house. The couple were divorced in 2012. Shortly after the SUV pulled away, a reflection of flames could be seen on a neighbor’s house through a surveillance video. The surveillance video showed some of the couple’s children running from the house. Several ran to a nearby Walmart to call 911; others went to a neighbor’s house. The 911 call came in about 5:15 a.m.
About 5:30 a.m., a 911 caller notified Highland emergency services personnel that a vehicle was in Silver Lake. A paramedic swam out to the SUV and saved the baby, who was floating in water with a small air pocket. The baby boy was revived and taken to a hospital, where he was doing well, Madison County Sheriff John Lakin said at a news conference Thursday afternoon. “Fortunately there is something good that can come of this,” Lakin said of the child’s survival. Cristy Campbell’s body was found around 11:15 a.m. about 400 feet from where the vehicle went into the water, Lakin said. It was pulled from the lake around 1:15 p.m.
Cristy Campbell alleged that Justin Campbell was abusing her in 2005 and 2012. In 2014, Cristy Campbell asked that Justin Campbell’s visits with the children be supervised, telling the court that one of the children said Justin had pinched and punched him and another child said Justin had choked him. Authorities said Thursday that they had answered about 50 calls at the Campbell home since 2010, including hang-up 911 calls, barking dog complaints and domestic calls. Madison County Sheriff’s Capt. T. Mike Dixon told the Belleville News-Democrat that what sparked the tragedy might never be fully known. Funeral arrangements for Cristy and Justin Campbell are pending, the coroner’s office said. Meanwhile, the response to a donation drive for the Campbells’ children on Friday evening was described as “unbelievable” by one volunteer. Piles of clothes, shoes, toys and diapers quickly stacked up at the event at Edwardsville High School that was arranged by Little Tigers Football and the Edwardsville Wrestling Club. McMeen said he didn’t know the Campbell family but he felt a personal connection to the children because as a child, his own home burned to the ground in a fire sparked by lightning. “It’s a terrible thing to have happen,” said McMeen, a father of three. Alicia Smith, a mother of three who is on the Little Tigers board of directors, said volunteers were unloading donations from a stream of cars that lined up at 5:30 p.m. and was still flowing two hours later. She said the goods already filled a garage, a box car, an upstairs storage area, an office and a courtyard. The organizers planned to store them until arrangements could be made to deliver them to family. The groups were also collecting monetary gifts and hoped to have not just enough to help with the children’s immediate needs but to set up college funds. Like McMeen, Smith said that while the outpouring had been overwhelming, she wasn’t surprised. “It makes you feel like this is a really great community to raise your kids,” she said.